Documented as such, the forty-year old Talking Book remains a pivotal moment in the timeline of Stevie Wonder’s classic album era. With this gem, Stevie was able to take hold of his creative control and muster out a uniqueness that forged him light-years ahead from the assembly line pop of Motown’s mighty arm. 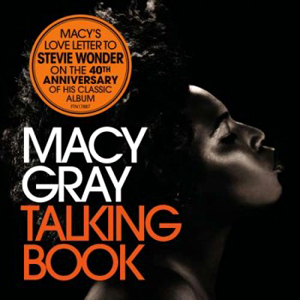 Coming off the heels of 2012’s Covered, eclectic singer-songwriter Macy Gray decides to crank out another covers’ set with a homage to Talking Book, an album that she openly confesses as being one of the most influential albums from her youth. Each of the songs are represented here and in its original sequence, but Gray’s unorthodox musical style – laced with Janis Joplin hippieism, Billie Holiday eccentricity and ambitious soul searching – isn’t going to walk the same pathway of Stevie. Her jazzy take of the sunny pop of “You Are the Sunshine of My Life” is the closest thing to color-by-numbers. It hardly abandons the easy listening vibes of the original and only cozies Gray’s raspy voice into fine gentle whispers. After the opener, the disc becomes a bit more ambitious. “Maybe Your Baby,” a definite standout on board, cranks up the psychedelic rock guitar and heightens the bar set by Wonder’s funk, turning ever quickly into a Funkadelic joyride. “You and I” transforms from a supple ballad into a mid-tempo Jill Scott neo-soul wonder. 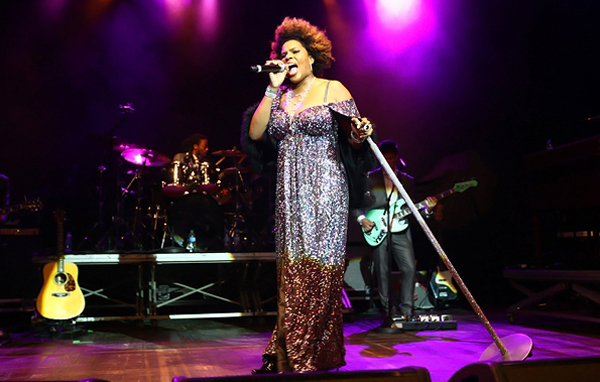 “Tuesday Heartbreak” keeps the tempo, emphasizes girly backing vocals and allows Gray to kick out her happy soul belting on the gospel-spiked vamp: “I wanna be with you when the nighttime comes/I wanna stay with you til the morning runs…Baby, It’s alright.” “You’ve Got It Bad Girl” shifts the tempo into Martha & the Vandellas overdrive and turns up the psychedelic buzz of the synths. “Blame It on the Sun” takes a while to lift from the ground due to its opaque acoustic lounge sound, but Gray’s vocal finally finds its resurrection on the second verse and as she adds new depth to the closing lyric (“But my heart blames it on me”). “I Believe (When I Fall in Love It Will Be Forever” adds a few more dimensions to its makeup including expanded choruses, some ska trips. It also moves the ambitious soul of the closer into the middle of the mix. Some of the musical alterations are a bit tough to swallow. “Lookin’ for Another Pure Love,” one of Talking Book’s signature duds (dodges tossed stones), lacks improvement of the original. To some, Gray’s distortions of Wonder’s pop tunes may be a bit whimsical to the ear, but it is her take of “Superstition” that creates the greatest turnoff. It’s virtually unrecognizable and totally abandons the melodies for a cosmic druggy excursion. Despite its need to rebel against tradition, no one with any formal knowledge of Wonder’s funky, proto-disco masterpiece would gravitate to this take. Luckily, the wholeness of Wonder’s Talking Book serves as a neat fit on Gray’s neo-soul expeditions. She’s singing some righteous songcraft and approaches the infamous disc like a jazz-trained songsmith. She’s careful in not going too far into the deep, but interprets the songs with heart and – for the most part – utilizes intelligent creative impulses. Certainly the average set of ears would prefer Wonder’s poppy voice over the raspy, peculiar sensations made by Gray, but those with an infinite appreciation for a voice that’s too uncanny for Top 40 expectations, her Talking Book will appear as the ultimate compliment to Wonder’s genius.